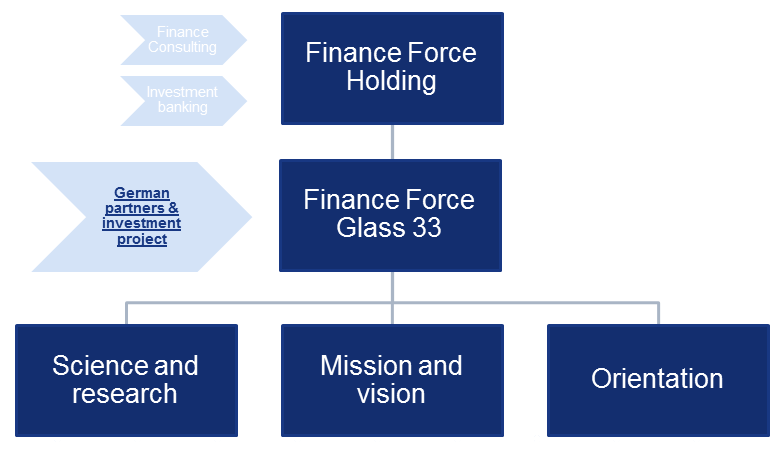 Finance Force Glass 33 is founded in 2011. in Novi Sad, Serbia, as a joint venture created by Finance Force Holding, which has remarkable business rating in finance consulting and investment banking area, and several German partners and investors. Our prime activity is scientific research with a goal to create new technology solutions which will contribute to global life standard and culture of living, to development of environmental awareness and advancing of energetic rationality and efficiency. Our scientific research is focused to so-called smart technologies in the glass industry which could be used in architecture, construction, motor vehicles industry and other. Our prime goal is creating of global tendency to implement our technology solutions in architecture, construction, ecology and all other areas with direct influence over human environment building. We believe that our technology has good market potential, as it follows the general trend of energy efficiency and also provides unlimited application possibilities.